If you missed Part 1, it's here. For Part 2, go here. For Part 3, go here. We may be in the home stretch, except for the fact that I keep thinking of more things to include. 14. Family Name Societies: I don't know of any directory of these (if you do, please let me know! ), but I've found a wonderful resource in the Familienverband Berneburg in Eschwege. This is a family association for the preservation of the history and genealogy of those with the surname Berneburg. What a find! It's opened up a huge area for me, and I went from not being able to get past my great-grandfather to having the name of my 11th great-grandfather, who was born in 1470! I don't know how to tell you to find such an organization, except to . . .
14. . . . Google it! : What good could it possibly do to try to find an ancestor who was born in 1840 through Google? Well, you never know what Google might come up with. I took a tip from 50 Best Genealogy Brick Wall Solutions and googled my great-grandfather's village and the year he was born: Oberglogau 1840. Much to my surprise, up popped the record of my great-grandfather's first marriage, not from Oberglogau, but from the OFB of a nearby village that included his place of birth. Since my great-grandfather didn't marry my great-grandmother until he was in his 40's, I'd always wondered whether he'd had an earlier marriage, and there it was. When you're stuck or bored or just have nothing to do, start googling stuff. You never know what you might find. And to go back to the section above, try googling "Familienverband ________," or "Ahnenforschung ______," whatever your surname is. Something might pop up. 15. City Websites: While you're googling, try searching for a website for the village your ancestors lived in. I found a website for Erkeln, where my great-grandfather was born, and it included a forum. So I posted that I was looking for anyone I might be related to, anyone with the name Ortmann, and I heard from several people and found a number of family members. 16. Online Forums: A number of online forums for German genealogy exist. The Ahnenforschung.net forum has subforums for all areas of Germany; unfortunately, the language of communication is German. Ancestry.com has many message boards on all kinds of subjects. While I was googling around one day, I found a forum on Genealogy.com dedicated to one of my surnames, Ortman. Always check the dates on a forum though; this one has been silent for a couple of years. 17. Postcards: Owning historic postcards can help you bring some of the dry details of history to life. 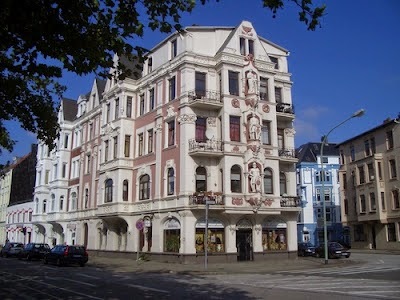 I like to browse at the akpool website, where they have many many postcards from Germany. I was lucky enough to find a postcard showing the building in which my mother was born -- fortunately, it is now a historically preserved building. 18. Historic maps: Maps can also help you bring stories to life. I always look at the addresses on a census, see if the building still exists, and try to get an idea of where it was my ancestors lived. If you go to Etsy and search on "historic maps," you'll come up with a number of vendors who sell them. 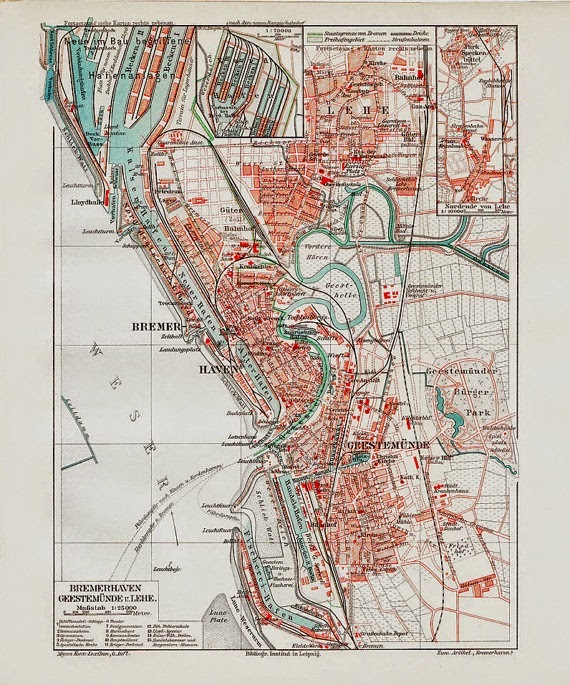 I got a great historic map of Bremerhaven that includes the street where my mother was born, the church where she was baptized, and a number of other significant places. It all helps to enliven the past! 19. How to Pay for This All: No, not how to pay for the subscriptions and memberships and so on -- you need to figure that out in your budget -- but how to pay for documents you're ordering from city archives or churches. Don't do what I did the first time -- go to your friendly neighborhood bank and have them transfer the money -- it wound up costing more than the documents themselves! If the recipient has Paypal, wonderful, but not that many places in Germany accept Paypal. I've heard good things about both Xoom and Western Union. Through my genealogical work, I've made a couple of friends in Germany who are kind enough to let me send them money and then they send it on to the archive. I'm very grateful for their willingness to do this! In conclusion: I'm sure that if I sat and thought for another day or two, I'd come up with something more to write about, but I think I'll stop and maybe do an addendum at some point. My best advice is for you to be open to any possibilities -- yes, do the grunt work that sometimes leads to good results, but be open to trying new things. I've had good leads and information come from unexpected places. Ask questions -- wondering how my great-grandfather happened to die over 100 miles from his home led to the opening of a fascinating story. Read documents very carefully and then read them carefully again -- you'll find that you might have missed some little tidbit. In going over my great-grandmother's marriage document, I noticed that her mother's surname was different from my great-grandmother's maiden name -- which led to the discovery that she had been born illegitimately, as had her mother and her mother's mother. Follow the historical trails you're led to -- right now I'm puzzling over why my great-grandfather's death record says that he was a Master Weaver and a "former trumpeter." What did a village need a trumpeter for? Was there an orchestra or a band? Let me know what you think of all this advice for newbies -- is there anything I've left out? Any valuable resources you've discovered? This work brings me an enormous amount of joy, and if I can share some of what I've learned with others, it makes me even happier. What a nice series of posts! It's a shame that Ancestry.com has shut down Genealogy.com, but at least they left the forum in read-only state so we can glean information from the old threads there.